You are currently browsing the tag archive for the ‘Elizabeth Johnson’ tag. Tot Mom Laments: I trusted you! Misty Croslin is NOT the only jailbird unable to keep her mouth shut. Newly released jailhouse audio in the disappearance of Baby Gabriel contains a lot of incriminating comments. Who says that Tot Mom is not talking? Tot Mom is going head to head with Sheriff Joe Arpaio. 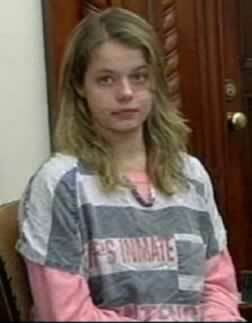 In a battle of wills, Elizabeth Johnson is threatening to starve herself to death rather then eat her new nutritious prison diet that she claims is full of rotten vegetables and worms. Where is Baby Gabriel, Elizabeth Johnson? Baby Gabriel still has not been found. Many different things have happened in this heart breaking tragedy over the last few months. On the positive side, Logan McQueary was awarded custody of his missing baby boy in a Maricopa County Superior Court on Friday, March 26, 2010. It is time for another look at what is going on in the disappearance of toddler Gabriel Johnson. Logan McQueary’s road trip to San Antonio in his search for his son has been very successful. Baby Gabriel’s father is actively helping to find his missing child. Another eyewitness of Tot Mom, Elizabeth Johnson, has been turned up which LE was not aware of. Tammi Smith is Boastful as Ever! New details have finally surfaced on the release of Tammi Smith from a Maricopa County jail. Tammi is stilled charged with three crimes. And is now threatening the Tempe Police with her boasts.